A staple of the film and video industry, the 5.7', black 20" Master C-Stand Turtle Base Kit from Kupo is comprised of a two-section double riser with a removable base, 20" grip arm, and a 2.5" grip head; almost everything you need to position your lighting and grip equipment where you need it on set. The Master C-Stand with Turtle Base from Kupo is a 20" Century Stand designed to support light fixtures and modifiers weighing up to 22 lb. Additionally, the stand has been given a black finish achieved by applying a black powder coating to the metal frame. Constructed with both strength and capability in mind, the Master C-Stand features three sections—two of which are extendable—which bring the stand's maximum height to 68.1". At its lowest, the stand collapses down to just 36.8", and is capable of supporting up to 22 lb at either height. The stand's base is made up of a traditional three-leg configuration with each leg set at a different height to allow for stand "nesting" on set. Of the three legs, two feature a spring-loaded design which rapidly extends and locks them into place, while the third may be height-adjusted via a locking knob on the riser's main section. In order to improve strength, the base has been cast from durable zinc alloy, making it five times stronger than traditional aluminum designs. The locking collars have also been cast from aluminum in order to prevent damage and maintain longevity. 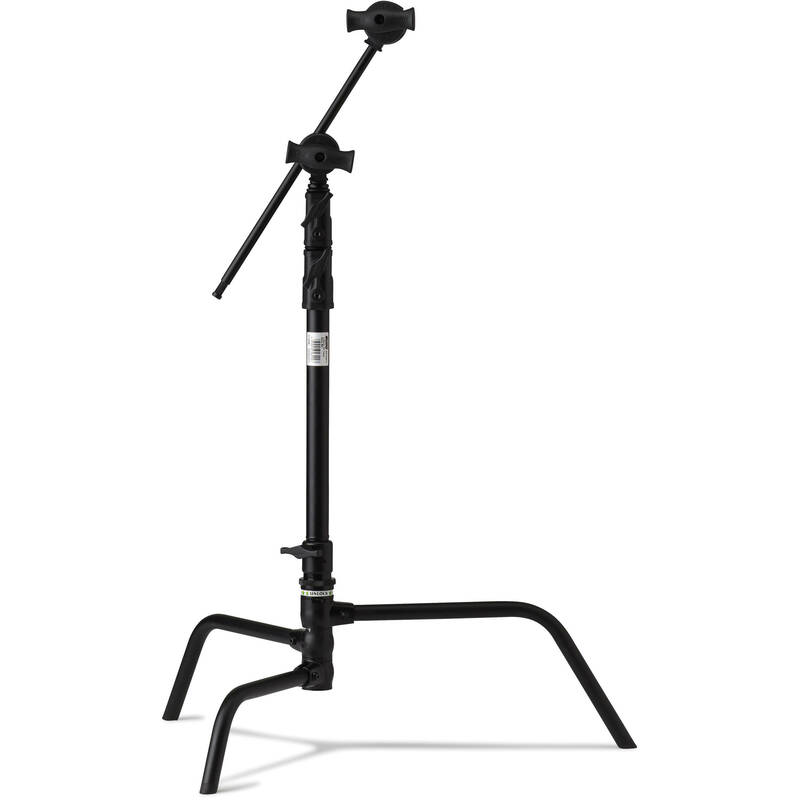 Often paired with a C-Stand, the black 20" Hex Grip Arm from Kupo has a 5/8" hex pin at one end of a 20" textured, non-slip steel tube and a 2-1/2" grip head at the other. The hex pin has 6 milled flat surfaces so that you can attach a light to it without it turning and use the arm like a mini boom. The grip head has a pair of rotating discs attached to a 5/8" receiver. The discs have 4 V-shaped jaws to accept 5/8", 1/2", 3/8" or 1/4" accessories like flags, scrims or even another grip arm. The jaws are locked down by an oversized, ergonomic T-handle. The 2-1/2" Grip Head With Big Handle from Kupo has four V-shaped jaws, an ergonomic oversized T-shaped handle with dedicated roller bearings for maximum torque, and a non-slip aluminum friction disc. This durable grip head is made of aluminum and steel and has a black powder-coated finish. Box Dimensions (LxWxH) 29.0 x 14.0 x 3.2"
Box Dimensions (LxWxH) 22.1 x 6.5 x 2.8"
Box Dimensions (LxWxH) 8.0 x 4.4 x 2.9"
20" Master C-Stand Turtle Base Kit (5.7', Black) is rated 5.0 out of 5 by 6. Rated 5 out of 5 by Janny from My first c-stand and I love it I went with Kupo after reading many reviews for c-stands and one person mentioned this one so I looked it up and also went to the website. They have good videos of how to setup the products. I love the black color and the portability. I dont have a car so I definitely need equipment that is portable. Thanks to the turtle base and the spring loaded lock this makes it easy to break down. Im only 57 so for me this is pretty tall. The only thing I think I will change is the boom arm. Its good but its a bit short. Im going to experiment and get the 40 boom arm. I do plan on getting two more 20s and three 40s. I highly recommend these, especially the 20 for shooting on location and not having a car. Rated 5 out of 5 by Kevin from LOVE it! This is quality equipment! Very nice! I love the ease of the Turtle Base. Very solid but not too large or heavy. I wish I had purchased this years ago. Do not hesitate! Kupo is the best! Rated 5 out of 5 by Ruben P. from You MUST own this! The best c-stand i worked with up to this day, practical, light weight extremely fast to assemble and not to mention you can do it with only one hand! YEP!! Rated 5 out of 5 by John from COMPACT SIZE but VERY STURDY Very good quality and structure, excellent for traveling due to compact size that fits in regular luggage, no need for additional bulky luggage. Rated 5 out of 5 by Shaun B. from Solid! Surprisingly good rigidity Love this stand and grip kit, very strong.